Cooked with tamarind water and achar masala. Aloo Bhujia is a delicious combination of vegetable cooked in an array of spices. Aloo Gobhi is a traditional Pakistani and Indian dish made with Spicy potatoes and cauliflower. A typical aloo curry in tomato puree. It has a flavor of all the spices along with ginger/garlic and a hint of lemon. 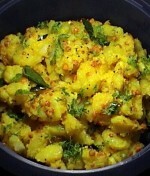 Famous vegetarian dish that has a dry potato vegetable preparation with spices. Aloo Methi is a very classic recipe where the potatoes are cooked along with the very aromatic fenugreek leaves.